This line-hunting excursion was a detour from our field trip to Heng County (横县) 100 km east of Nanning (南宁) city, the capital of Guangxi. The visit to Heng county brought us about 33 km GPS distance from this confluence point. After we concluded our visit with a special lunch – raw fish from the nearby river with dozens of spices (photo 9), we departed around 2.30 pm. Instead of heading straight back to Nanning by expressway, the entire party went on the hunt by taking a series of small country roads. After almost an hour of drive, we reached Gan Tong Township (甘棠镇) which put us just about 2 km from the confluence point. A little bit further up the highway we found a dirt road on the left heading toward the confluence point. This rough dirt road headed straight up on a steep hill, and we found an even rougher path 580 meters away from the confluence point where we started the hike. The downhill path led us to a chicken farm, and after another 200 meters we left the trial and work our way through tall grass and pine trees. We found the confluence point located near the top of a 40 degree slope with waist high grass. 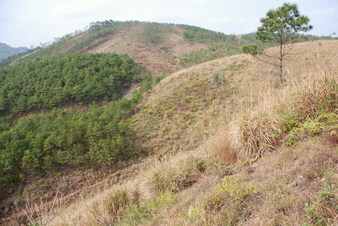 The top of the slope is a good vista point. There are dozens of chicken farms dotting the surrounding hills. Two first-time line hunters were initiated from this trip.